Wilson NCode NTour Pro Staff Squash Racquet Excellent Condition! With cover! Wilson NCode NTour Pro Staff squash racquet in beautiful, excellent, used condition! The racquet features a 3 7/8 grip size. There are no cracks or any structural issues. The buttcap is also in very good condition. Where up to 40% of the rackets performance is derived from the string bed it is critical that you have the best string in your racket ! The 3rd weight option is the Raw 130. This racket has 100% graphite construction with long strings and open throat, updated this year with attractive new artwork. We have kept the artwork and the decals to a minimum so were able to reduce the weight. Please message to purchase more than 1 box for reduced price on postage Brand new pack of 12 double yellow squash balls. Karakal T120 Squash Racket. Full cover included- slightly different colour from racket- black/yellow. Strung with Hot Zone 120 string. Squash Rackets Tennis Rackets Badminton Rackets Golf Hockey Racquetball Tennis Balls Cricket Bats Football Sports Footwear. Badminton Rackets. Squash Rackets. 2 x Wilson performance squash balls. 1 x Wilson Impact Pro squash racket. RESTRINGING LABOUR. TENNIS RACKET RESTRUNG FOR ONLY £14.95. Need more than one racket re-stringing - from 1 to 100 ill give you the best quote i can. Want to use you own string ??. Squash racket weight without cover is 171g. There's a couple of scratches to the racquet head (favourite place for this) and the handle tape is a bit grubby. You are viewing a HEAD 195G Squash Racket. This is a older model of a squash racket which is very difficult to get hold off. This is a classic racket! This is a new Wilson Hyper Pro Staff Hyper Carbon 165 Squash Racquet. Still in EXCELLENT CONDITION.Would suggest re-griping to your playing style. WILSON- Hyper Pro Staff - Hyper Carbon 165 Squash Raquet - Blue / Black / Gray. 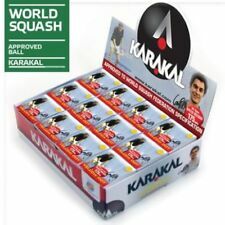 As worn by players on the Karakal Squash Pro Tour. The Karakal Pro Tour Jacket is a 4 way stretch technical breathable hoody. Body shaped. 4 Way Stretch. / EAN 4028067013333. SQ-X9 | L12 / 11 Q. Balance kopflastig. Weight(±g) 125N / 150B. slazenger junior panther match Graphite composite construction squash racket 27"
There's a couple of scratches to the racket head (favourite place for this) and the handle tape is a bit grubby. In very good condition. The Slazenger demon racket is in nice condition. The head is twisted and the paint is flaking off a little in places. There is a crack at the top rim of the head. Both the squash international rackets have a bit of a twist in the head of them but they are otherwise in nice, used condition. Oliver X-LIGHT 9.1 Squashschläger ehem. UVP: 164,95. der im Racket Test von Hobby- als auch von Bundesligaspielern mit der höchsten Ballbeschleunigung bewertet wurde. Racket of the champion. Nachfolger vom X-Light 77. Pro Tour Match – New to the range this year is the Pro Tour Match. A versatile racket bag designed to hold around 4 rackets. 4 Racket Match Bag. The compact size makes it very comfortable to wear. Valuables side pocket. Balanced long string racket with high dynamics. / EAN 4028067013647. Target Group Profi/Turnier. String / Rec. Kg SQ-X5 | 12L / 10Q. Balance balanced. The Wilson Blade Team Squash Racket supports rotation and spin enabling the player to provide greater impact. The racket also as has a larger sweet spot creating more power when making shots. The Wilson Blade Team Squash Racket enables greater manoeuvrability, supports rotation and swing through the string system. You are viewing a Prince Force 3 Sierra Ti Squash Racket. This is a very light weight racket. This is a very advanced racket! 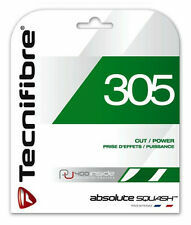 In TECNIFIBRE SYNTHETIC GUT FULL RESTRING. RESTRINGING LABOUR. SQUASH RACKET RESTRUNG FOR ONLY £19.99. Want to use you own string ??. 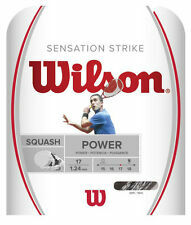 You are viewing a Wilson Punisher Titanium Squash Racket. This is a very light weight racket. This is a GREAT racket! All these parts provide great balance between power and touch. Dunlop squash racket - Aero T1 - very good condition. Some cosmetic discolouration of the handle but no wear. The Tecnifibre Carboflex 130 squash racket is the racket choice of Nour El Sherbini. Squash Rackets Tennis Rackets Badminton Rackets Golf Hockey Racquetball Tennis Balls Cricket Bats Football Sports Footwear. Construction - 100% Oxygen Injected Carbon-Titanium. 100% Oxygen Injected Carbon-Titanium for ultimate in lightness and strength. Titanium strings for response and durability. Open throat design for better touch and feel. Squash Rackets Tennis Rackets Badminton Rackets Golf Hockey Racquetball Tennis Balls Cricket Bats Football Sports Footwear. Badminton Rackets. Squash Rackets. Heat treated nano carbon for a more durable powerful racket. Downgrade Squash Balls are great for learners and kid's play. Squash Rackets Tennis Rackets Badminton Rackets Golf Hockey Racquetball Tennis Balls Cricket Bats Football Sports Footwear. Badminton Rackets. Squash Rackets. Tennis Rackets. With the Head IG Power you can effortlessly hit the ball hard. Used but generally in good condition with barely any wear to the tread. 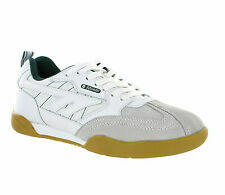 The pair of plastic parts at the top of the laces are yellowed on one of the trainers. For hygiene reasons the cellophane will still need to be on the racket handle with no sign of usage on the racket. Helpful Links. Soft grip handle for a comfortable hold. All of our products are 100% legitimate. Ascot 2070 Point Five Squash Racket, Original Vintage Unused Stock !! ​Original old Ascot Squash Racket. make Supersized seem small. There is a small area of staining around the base of the grip otherwise condition is very good. Wilson Triad 3.0 With Hammer Technology Oversize tennis racket Used. Condition is good with obvious signs of use but certainly has not been abused. Head size is 115sq in/742sq cm. Racket weighs 276g approx. Head SXT Squash racket, very good condition!